We’d love your help. Let us know what’s wrong with this preview of The End of the Hunt by Thomas Flanagan. To ask other readers questions about The End of the Hunt, please sign up. This is a fine book that was a challenging read, partly because I had to check a history of Ireland and some web sites on the names of World war I era arms and vehicles for some background that the author assumes we know. That said, I am grateful to Thomas Flanagan for the vivid portrayal of the attitudes that propelled the Irish War of Independence and the Civil War. Some folks have commented that Michael Collins is the central character in The End of the Hunt, but I have to disagree. Collins an This is a fine book that was a challenging read, partly because I had to check a history of Ireland and some web sites on the names of World war I era arms and vehicles for some background that the author assumes we know. That said, I am grateful to Thomas Flanagan for the vivid portrayal of the attitudes that propelled the Irish War of Independence and the Civil War. Some folks have commented that Michael Collins is the central character in The End of the Hunt, but I have to disagree. Collins and to lesser degrees Brougha and De Valera provide the historical backbone of the work but the narration centers on several fictional characters who provide us with a range of points of view on the events of the period. Particularly interesting is the perspective of Janet Nugent, a member of the Irish Catholic gentry and a war widow, who often lets us see the disconnect between the passions of those directly involved in the conflicts and the desire on the part of most to simply get on with their lives. Over the years I've read both Year of The French and The Tenants of Time, books that tell the story of historical attempts by the Irish to wrest their small island from the tentacles of the British Empire. The End of The Hunt tells the final chapter, the successful uprising led by Michael Collins in the 1920s. For those who have seen the film, Michael Collins, which was partially based on material from this excellent book, the territory will seem somewhat familiar. Flanagan tells the story throug Over the years I've read both Year of The French and The Tenants of Time, books that tell the story of historical attempts by the Irish to wrest their small island from the tentacles of the British Empire. The End of The Hunt tells the final chapter, the successful uprising led by Michael Collins in the 1920s. I thought I'd never finish this book; it is very densely written and nearly every sentence is packed with information. It was well worth it. The history of the English in Ireland is brutal and tragic. This novel takes place in the aftermath of the Easter Rebellion in Dublin 1916.It is largely about the signing of the treaty with the English in 1921 and the ensuing civil war between the freedom fighters wanting the free Irish Republic. One side, Sinn Fein, tries the political and diplomatic rout I thought I'd never finish this book; it is very densely written and nearly every sentence is packed with information. It was well worth it. The history of the English in Ireland is brutal and tragic. This novel takes place in the aftermath of the Easter Rebellion in Dublin 1916.It is largely about the signing of the treaty with the English in 1921 and the ensuing civil war between the freedom fighters wanting the free Irish Republic. One side, Sinn Fein, tries the political and diplomatic route; old warriors do tire of bloodshed. The other side becomes the notoriously violent Irish Republican Army. They eventually turn upon each other. The 3rd in the series --- very helpful in understanding the civil war , etc. I liked it because the 'fictional friends' were also included, and made it easier to understand. What makes recent violence worse than that of years ago? I squirmed that those I rooted for were assassins. This was the first of the Flanagan trilogy with well developed women characters and I found myself wanting to hear even more from them. All three books were wonderful for giving me even more feeling for what I think of as my second country. Flanagan's three books of fictionalized modern Irish revolution are excellent. This is the weakest of the three - a little slack and loose-lipped, as if he were dictating it over a Guinness and no one felt like editing. Still a great read, though. Maybe it was because we were staying outside of Dublim for a month one summer, but all the history of the Troubles of 1919 came to life in this very readable novel. I recommend it highly if you wish to come to grips with Ireland's struggle for independence. 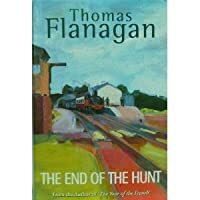 Thomas Flanagan's trilogy of Irish historical novels winds to its relentless close with the Free State established in the 1920's after the bloody civil war, and the stage set for the Troubles through the rest of the century. A vivid portraint of Michael Collins. Michael Collins, Winston Churchill and a score of other participants. Another fine book by Flanagan on the history of Ireland with his fictional characters woven into the story. Thomas Flanagan (November 5, 1923 – March 21, 2002) was an American professor of English literature who specialized in Irish literature. He was also a successful novelist. Flanagan, who was born in Greenwich, Connecticut, graduated from Amherst College in 1945. He was a tenured full - Professor in the English Department at the University of California, Berkeley until his retirement. Flanagan died Thomas Flanagan (November 5, 1923 – March 21, 2002) was an American professor of English literature who specialized in Irish literature. He was also a successful novelist. Flanagan, who was born in Greenwich, Connecticut, graduated from Amherst College in 1945. He was a tenured full - Professor in the English Department at the University of California, Berkeley until his retirement. Flanagan died in 2002, at the age of 78, in Berkeley. He won the National Book Critics Circle Award in 1979. The Archives and Special Collections at Amherst College holds his papers.